Yesterday we learned that homeownership in America has improved recently and may even be reaching a turning point. Overall, though, the proportion of owner-occupied households in this country remains near a half-century low. There are a handful of factors that have driven down the homeownership rate during the past few decades but a more recent issue has been student loan debt. Indeed, Millennials are by far the best-educated cohort of the workforce but many Gen-Y adults borrowed money to pay for college, and it is therefore unlikely that some will proceed with a major financial transaction, such as purchasing a home, before eliminating that liability. 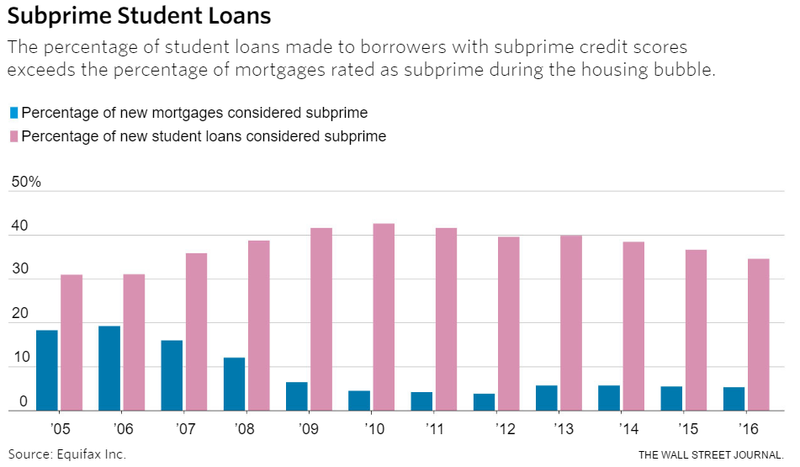 Even for those young adults who do not want to wait to buy a house, their student loan debt could hinder their ability to get financing, something which helps partially explain why all-cash home purchases remain elevated. What is worse is that student loan debt not only prevents many young adults from purchasing a home but also from starting their retirement savings early. Indeed, a report from Aon Hewitt found that 28 percent of surveyed U.S. adults said that they currently have an outstanding student loan. Respondents with such liabilities were found to be participating in employer-provided retirement plans at a lower rate than those without education-related debt, and therefore potentially missing out on full company matching contributions. Further, more than half (51 percent) of surveyed workers with student loans reported that they are contributing only 5 percent or less of their income to a retirement plan each year. Seemingly small differences in saving rates can have a big impact on your retirement nest egg. For example, the Aon Hewitt researchers estimated that a hypothetical 30-year-old setting aside just 4 percent of pay will have accumulated a 401(k) plan balance of $351,407 by age 65, while someone saving 6 percent will have a balance of $527,110 at age 65, a difference of $175,703. Generation Z will likely have to deal with similar challenges given the rapid and relentless rise in tuition costs. Student loan obligations can not only hinder young Americans’ ability to save for retirement but also reduce the benefits they receive from the government in old age. Specifically, current law allows earned Social Security benefits to be garnished by the government as a way to help with student loan and other federal debt collections. In fact, the number of Americans who have had their benefits garnished by the government has surged from 36,000 in 2002 to 173,000 in 2015, according to the U.S. Government Accountability Office (GAO). A bill was introduced in the Senate last week that would further limit the amount of earned benefits that can be garnished by the government, as well as provide a few other protections for senior debtors. However, people should still strive to pay off their student loans and other financial liabilities as soon as possible so that the funds going toward these obligations can start to be put to better use in a tax-advantaged retirement savings vehicle. Moreover, consulting with a professional financial advisor can help such individuals come up with a plan for paying down their debt quickly and maximizing the growth of their savings.